No homeowner wants to get burned by a bad remodeling project. So, we’ve developed a comprehensive guide to help you avoid becoming a victim. By following our guidelines, you can dodge the dreaded remodeling nightmare that’s all too common in this industry. Our newest resource, titled “How to Prevent the Home Remodeling Nightmare,” will be available for download later this month. The guide will tell you want to do, as well as what not to do, before you ever interview your first candidate. It’s true you’ll find both good and bad players in the remodeling industry. With our new reference guide, you’ll learn how you can separate the wheat from the chaff. With some knowledge and a little work, you can protect yourself from sub-par contractors. After all, you’re in the driver’s seat! Discover what steps you need to take to ensure a smooth project and successful outcome. Watch for an upcoming announcement blog. 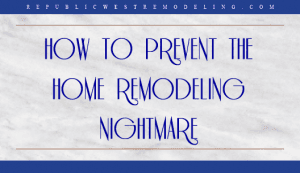 We’ll post instructions on how you can claim your copy of “How to Prevent the Home Remodeling Nightmare.” You can also continue to read the Republic West Remodeling Blog for more information on topics and issues related to home remodeling.